Medusahead is a grass species native to the Mediterranean region of Europe. It was likely introduced to North America by accident. Medusahead out-competes native species and forms dense populations. It forms a dense layer of litter (dead plant material) that prevents germination of seeds from other species. This grass grows 25-50 cm tall and has very distinctive flowering spikes. They are 1-5 cm long and have very long awns on the seeds that are up to 10 cm long (awns - hair-like or bristle-like extension on a larger part of the plant). The spikes stay green longer than most of the other grasses. 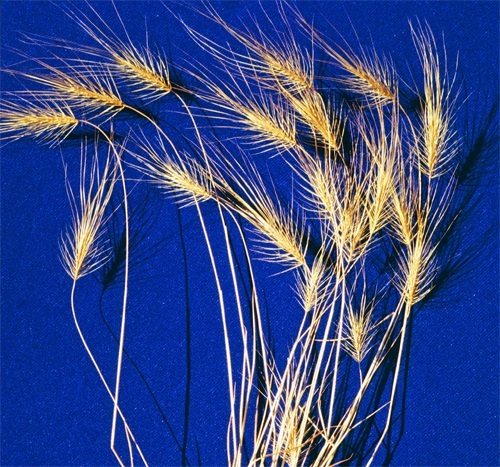 The awns become twisted when they dry, giving the grass its name. Another common name is “medusahead wildrye”. Medusahead grows in dry and open areas and can be found together with Downy brome.